Great assortment of recipes! Thank you for including my Baked Porcupine Meatball recipe. I hope you enjoy it as much as we have for 3 generations now. I'm going to have fun and browse through many of these recipes! MikekeyK, Thanks for includig myrecipe. 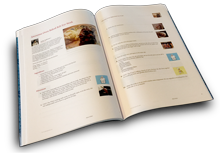 Your cookbook looks like a bestseller! You are welcome, Wiley and RC. Looking forward to both recipes. What a great list of recipes for your bucket list, Mikekey - I'll be trying a bunch of them out as well! And I'm honored you included my Spring Hill Ranch's Cranberry Sauce and Salsa in the list and know you'll really enjoy it! Good luck in getting through all of 'em, Pard!